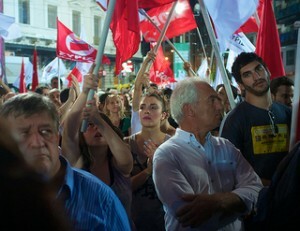 Much has been written about Greece’s repeat elections taking place today, the country’s ongoing financial problems and potential exit from the Euro, as well as the worsening European economies (last week Spain asked for bailout money, Cyprus is next in line to ask, and many believe that Italy will follow). I recently spent a few days in Greece and Spain. During these visits I sought to interact with as many people as I could, including friends and family, in an attempt to understand the impact of the economic crisis on the peoples’ everyday lives. I try to visit Greece every year, but it had been a little over 3 years since I last visited Spain. In Greece I saw a dramatic deterioration of the conditions I encountered just 12 months ago, and not sign that the situation will improve any time soon. The impact of the recession (now in its fourth year) and of the high unemployment have become amply evident. In Spain I heard more open discussion about the high unemployment. Everybody I spoke to appears to know somebody who is unemployed. As I was walking around city streets in both countries I was struck by the high number of closed shops, even on major, high-traffic thoroughfares. Some stores appear to have been abandoned with their merchandize still inside; many of the stores were defaced with graffiti and advertising posters or even boarded up. The magnitude of the problem is particularly evident at night when city streets that were brightly lit from the lights of display windows are now dimly lit by street lights. Many streets have become uninviting resulting in reduced foot traffic even for the stores that remain open. Very much like we experienced in the US during the 2009 recession, the impact of the economic crisis in Greece and Spain is particularly evident on the small businesses. They are closing at an alarming rate. Stores that have been passed from generation to generation are closing for good and with them certain professions may be lost forever. In Greece I saw “going out of business” signs in old stores that sell spices, worry beads, folk clothing. In Spain I saw similar signs in businesses that sell handcrafted lace, hand fans, religious holiday clothing, and specialized threads to be used in things like tassels. The owners of these stores are not simple retailers. In many cases they are also the artisans that made the items they sold. In other cases they were the “fronts” and had the relations with networks of artisans that created the merchandize being sold. These relations were passed from generation to generation. Even after the economy improves, these types of stores and the associated professions will likely not come back. Commerce in general is at a standstill. Though open, many companies are not transacting because people are mostly worried about addressing their basic needs. But despite the lack of commerce activity, I found the prices in both countries to remain stubbornly high, even if without the VAT, which in Greece is an eye-popping 23%. Commerce may improve in Greece if a stable government emerges out of today’s elections (doubtful), and in Spain after the public understands the terms of the bank bailout being discussed. I saw fewer people going out at night. Both Greece and Spain are notorious for their nightlife with restaurants starting to fill out around 10:00pm for dinner. Not this year. The locals I spoke to told me that over the last year they have significantly curtailed going out, and when they do, they frequent less expensive places; coffee shops rather than restaurants, taverns serving cheaper meals rather than full-service restaurants, movies rather than theaters or music halls. In both countries people appear to be permanently tense, a complete change to their traditional attitude which was optimistic and was expressed with warm smiles even to strangers. You can now see the tension in their faces, and you can hear it in their voices. They worry about how the new economic reality will impact the “social contract” they have had with the state since after the last world war in areas such as health care, retirement income, etc.. They worry about the solvency of the banks where they have kept their savings and they are desperately trying to find ways to move money to countries with stronger banking systems, which explains the recent flight of deposits from Greek and Spanish banks. While they may not be able to fully understand the notion of a country in default, they are starting to understand the potential ramifications of such an event to their lives, e.g., impact on energy imports (will I be able to heat my house? ), medicine imports (will I be able to find the medication I need? ), food imports (will I be able to buy the items I need to cook a meal? ), etc. Almost everybody I met with (Greeks and Spaniards) wanted to know how Americans expect the situation will play out in Europe and what will be the outcome. I didn’t understand why they believe that. Maybe because they feel that we get better information than they about their economic problems. Or maybe because they believe Americans can see a more optimistic outcome to the crisis. I could also tell that many people continue to view the economic crisis as a “bad dream” that will soon end, rather than a new reality with which they have to live for many years, even decades. People are ready for leaders that will effectively address the problems they are facing. They have lost faith in and confidence that their current political leaders will be able to do so effectively. Greece’s political stalemate is a reflection of that realization, and the new governments of France, Spain, and Italy are further manifestations of this notion. The middle and upper-middle classes are disappearing in both Greece and Spain. There are more signs that poverty is increasing (the reappearance of soup kitchens in Greece, more people in both countries buying foodstuff from farmers markets and less from supermarkets, more people buying on credit from merchants they know; they don’t have cash to pay and their credit cards are maxed out). This is particularly evident in the smaller cities as well as the suburbs of large cities. The thought of moving to another country where they believe there are better economic opportunities, even if they have to suffer in the short term, is starting to become serious. Greece has not experienced a significant emigration wave since the 60s (when many people left the country to work in Germany, Netherlands, and even Scandinavia). An emigration wave to the US (the third and smallest of the 20th century) occurred during the 70s when several Greek professionals and academics came to this country. Friends who just a few years ago thought that I was short-sighted for having moved to the US in the 70s (because the Greek economy appeared to be doing so well during the 90s and up to the Athens Olympics of 2004) are now asking me how they can immigrate to this country themselves. I spoke with parents of grade school- and high school-aged children who are now openly asking about ways to send them abroad, as they worry about their future should they remain in Greece. And if they don’t see any opportunities to emigrate abroad, people in both Greece and Spain are starting to seriously contemplate moving out of the large urban centers and back to the smaller cities and villages where their families came from. In Greece, while some people are starting to talk about the need to “rebuild” the country on a more solid, particularly economic, foundation, it is not clear how much they will need to take apart before they can start building again. Will they need start thinking about how Greece was in the 60’s when the middle class was just being formed, the 70’s after Greece emerged from 7 years of dictatorship or the 80’s after it was admitted to the European Union. These are not easy decisions and may imply a painful process for at least one generation, something which the public is not ready to contemplate yet. Of course, even if they are willing to take things apart in order to rebuild, they will need to take into account the interconnectedness of today’s world and economies rather than the stand-alone conditions under which Greece developed after the Second World War and its Civil War. I came back humbled by what I saw, worried both about the future of family and friends I have in both countries and contemplative about whether this country will be able to avoid facing the situation that Europe now deals with daily and will be dealing with for years to come.